Severe anxiety. Fear of retaliation. Shame. And a sense of having been abandoned by their leaders. That's how more than a dozen current employees interviewed by CNNMoney describe the mood inside Wells Fargo (WFC) in the aftermath of the fake account scandal that has shaken the bank to its core. "The culture is toxic," said John, a Wells Fargo home mortgage consultant. CNNMoney is not identifying any of the workers by their real names because each of them insisted on anonymity for fear of getting fired. The post-scandal atmosphere has taken a huge toll, John said, because customers now assume "Wells is scamming them." Things have gotten so bad that John said he is taking Xanax to control his panic attacks. "It's beyond embarrassing to admit I am a current employee these days. My family and friends think I'm a fraud for working at Wells," John said. It's been just over seven weeks since Wells Fargo admitted to creating as many as 2 million unauthorized accounts and firing 5,300 workers since 2011. The scandal led to the abrupt retirement of longtime CEO John Stumpf. New CEO Tim Sloan has vowed to make things right at Wells Fargo, but recent conversations with current employees suggest he has a long road ahead in fixing how workers in the trenches feel about top executives. "They don't care about us. All they care about is money in their pocket," said Jane, a Wells Fargo collections worker, who said she is being treated for depression and anxiety due to the high-stress environment. "Wells says they are there for us. I have not seen it," she said. The anger at Wells Fargo leadership stems from attempts by the top brass in the immediate aftermath after the scandal broke to shift blame onto lower-level employees. "We have been dragged through the mud. We have been outright blamed by our CEO," said Sandra, who works at a Wells Fargo call center. The problem, according to Wells Fargo employees, is they have been criticized for trying to hit unrealistic sales goals set by executives far above their pay grades. "I'm horrified by the blame being placed on retail staff," said Eve, a Wells Fargo private banker. Even Sloan, Wells Fargo's new CEO, acknowledged in a recent speech that the bank bungled the initial response to the scandal. "Many felt we blamed our team members. That one still hurts, and I am committed to rectifying it," he said. Wells Fargo scrapped the controversial sales goals on October 1, and Sloan said Wells Fargo plans to introduce a new performance plan for retail bankers based on "customer service, growth and risk management." These efforts and the company's removal of the tough sales goals may be starting to make a difference. One Wells Fargo fraud investigator, Sarah, who is a big critic of the bank, said things have started looking better for some of her colleagues. For instance, she said coworkers in the online customer service unit were less stressed due to the removal of sales goals. "They can just concentrate on assisting the customer instead of having to sell something every call," Sarah said. CEO Sloan has also been more forthcoming than his predecessor about the problems at Wells Fargo. He admitted the culture has "weaknesses" that have caused a morale problem. He told analysts it would be an "understatement" to say Wells Fargo employees have been "put through the wringer" as a result of the scandal. Hoping to make amends, Sloan has apologized to employees for the "pain you have experienced as team members as a result of our company's failures." He added, "We are not in denial about our reality." But if he wants to right this ship, Sloan may want to make sure his message is being heard by all managers, especially given the size of the bank. Rebecca, a Wells Fargo employee who works in a California call center, said things have actually gotten worse recently. She said her group was recently told not to use the restroom outside of scheduled breaks without a doctor's note. "The new CEO has no impact here in the trenches. People here are angry...feeling very dehumanized," Rebecca said. 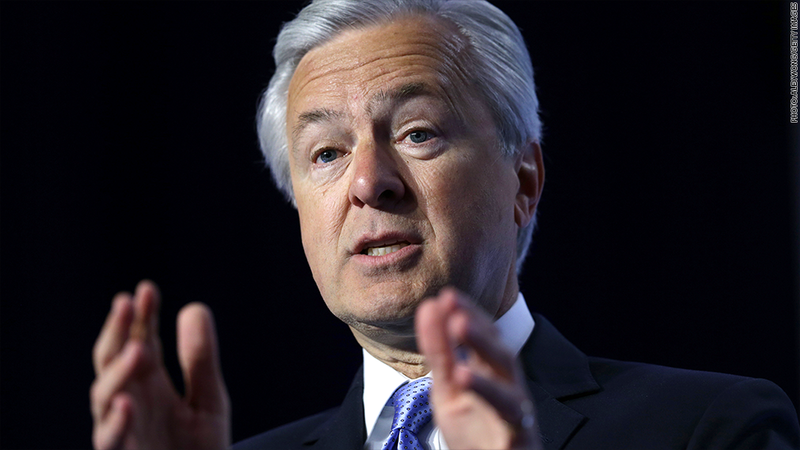 "Wells Fargo can give $120 million to a crooked CEO -- but won't allow us to pee." The issue of workers being denied bathroom breaks is a troubling one that came up often during CNNMoney's conversations with employees. It's unclear how widespread the problem is now, but former and current employees say it's resulted in stomach-related ailments in the past. Nathan Todd Davis, a former banker, publicly described the problem to a Wells Fargo executive at a recent California State Assembly meeting. A Wells Fargo spokeswoman said the bank complies with all applicable state and local laws. She said Wells Fargo is "investigating" the new claim from the employee about being denied bathroom breaks. "If we find it to be true, it is completely unacceptable and we will take immediate action," she said. Another problem: fear of retaliation. As CNNMoney previously reported, almost half a dozen Wells Fargo workers say they were fired prior to the settlement after calling the confidential ethics hotline. Sloan has sought to address this problem, calling it "disturbing to hear claims of retaliation against our team members." He said Wells Fargo is doing a "thorough review" of its ethics line process. But letting his rank and file employees feel comfortable about using that hotline will not come easily, given the alarming allegations. Several current Wells Fargo workers say they are still scared there will be negative repercussions if they blow the whistle. "If and when we do speak up, it's disregarded," said Barbara, a Wells Fargo employee who works on auto loans. "They will twist what you say to make it seem like you're crazy."